There’s a really strange element to traveling across Northern Ireland, in that almost every place name is familiar as the site of a bombing, or a murder or some kind of act of sectarian violence or political significance from the last 30 years. It’s like visiting southern california and driving past signs for Mulholland Drive and Sunset Blvd, only instead of feeling like you’re on a film set, you feel like you’re a bystander on a news broadcast. It’s a strange thing with place names – like Columbine or Waco, Darfur or Wounded Knee – they cease to be the name of a town, and become shorthand for disaster, for tragedy, for crazy behaviour. Belfast is one of those places that is now forever going to be a benevolent place in my mind – you know, those towns where the only people you know from there are lovely, so you subconsciously think that everyone there is delightful and friendly and wonderful? Nashville’s like that too. And Edinburgh is all about creative people being wacky on the royal mile… except it isn’t really, it’s just how you file things according to your experience. So Belfast is a place of community and parties and good food and great conversation and lovely lovely people and Neil Diamond, Bond Themes, hopes for the New Year, lots of hugs, a place to realise just how pathetic my knowledge of film is and how much catching up I’ve got to do, a place to walk along the beach in the freezing cold talking about child development and irving Goffman, Kierkagaard and the essence of self. So at least one place has changed ‘Belfast’ is no longer just the site of orange marches and bomb scares. I’ll smile every time it’s mentioned on the news now. December 31st, 2006 · Comments Off on Happy New Year! Happy New Year, bloglings. I hope you’re having fun, spending it with people you care about, and taking the time to reflect on the year gone and look forward to the year ahead. 2006 has been a really interesting year. Some good stuff, some not so good. 2007 looks like being a year of transition and change for so many people I know, and I hope and pray for all of them that those are changes for the better, changes that enable them to live more deliberately, more fully and to see their own potential for changing the world around them. Ok, this is a tough one to write, for a couple of reasons. Firstly, to echo the words of Hugo Schwyzer in his post about this subject, I love flying. I love travel, I love the feeling of limitless possibility that one has in airports. It’s my one major concession to hyper-modernity – the sleek lines, shiny metal and monorails make me feel like I’m in the Jetsons. I’m a travel junky, and I’ve benefitted hugely from my experiences when traveling. OK – firstly, full disclosure – I’ve got two transatlantic flights coming up – I’m flying to NYC in Jan, then to LA and then home from SF. That’s a lot of flying. It pretty much uses up my carbon allocation for the next year. So what have I done to change things? Well, I’ve pretty much sworn off short-haul flights (I say ‘pretty much’ – I haven’t been faced with a really good paying gig that I’d be required to fly to in order to accept it.. I’ve no idea what I’ll do if that comes up, to be honest) – but I’ve completely changed the way I do gigs on the continent – it’s now all about doing a month at a time, and doing it all on the train. And as my October trip proved, it works. Well, even as a solo artist. As a duo, it’d be a cinch. So – I really need to think hard about how the transatlantic thing works. I’ve looked into boats, honestly, but it doesn’t seem possible for less than a couple of grand… So where do I draw the line? Allow myself a couple of transatlantic flights a year? I dunno, I’m struggling here, but I am going to get the train and boat to Belfast over new year, so that’s one short haul flight I’ve foresworn… it’s much cheaper on the train/boat anyway! Duke Special and BJ Cole live at the Purcell Room. December 14th, 2006 · Comments Off on Duke Special and BJ Cole live at the Purcell Room. Duke Special live at the Purcell Room. 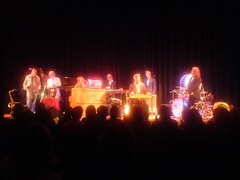 Great gig last night – Duke Special and BJ Cole at the Purcell Room. I’ve known Pete Wilson, AKA Duke Special, for years – he’s a lovely bloke, hugely talented, and is finally getting the acclaim he deserves. Last night’s gig was part of a ‘Cool Yule’ pair of gigs – the next one being the Juliet Turner gig next week, and I felt in some way proudly responsible for this one as the lovely promoter JJ met BJ at the gig BJ and I did together at the Half Moon a few months back. The gig started with BJ’s set, with his ‘Trouble In Paradise’ trio, featuring Ben Bayliss on laptop monkeyness and Eddie Sayer as percussion hobbit – it’s a really great trio, with Eddie in particular adding a crazy human element to all the looped and programmed beats etc. The steel was a little too quiet on the gig, frustratingly so at first, but still ’twas a great set. the aftershow party was magic – a room full of really lovely people, 80% of whom I already knew, and a load of other lovelies that I didn’t previously know. Was in Wales last night. Cross Keys to be precise. Somewhere near Newport. Not quite sure where though. The gig was put on by Islwyn Guitar Club, and as such was half gig half guitar club stuffs. Started with a bit of a workshop from me, which from the feedback on bassword was much appreciated, thankfully… Then onto a bit of a play round, couple of nice guitar contributions, then Andy Long making his solo bass debut, and doing a fine job of it, followed by Alun Vaughn playing a 20 minute solo set – some great playing, no loopage or processing, just six string bass, a gorgeous version of Here’s that Rainy Day, and a solo bass version of Purple Haze that was completely different to Michael Manring’s, which made a very nice change. I had two 45 minute sets, so did a similar set to the ones in Kleve and Milan – lots of older tunes in the first set, and lots of Behind Every Word stuff in the second, plus Deep Deep Down (Eric Roche’s tune that leads into Deeper Still), and What A Wonderful World. Also had a bash at a completely solo version of Knocks Me Off My Feet as an encore (an encore! I hate encores, but still…), which shows promise! So there endeth the European Tour – next gig is the Recycle Collective first anniversary gig on 15th November at Darbucka – you SO don’t want to miss that. Rumour has it there are people coming from Denmark to be there… beat that, Italian blog readers!!! haha! Catching up – three very very busy teaching days Thurs/Fri/Saturday – much fun. Busy days like those are a great confirmation of how much I enjoy teaching, I love getting to the end of a day, feeling that I’ve worked hard, and the students have all taken away lots of good quality stuff to work on, hopefully been inspired and are beavering away at their practice! Saturday after teaching was a visit to see my dad – really ought to see him more as he only lives half an hour away. A most enjoyable few hours. this was the first night of the new year for the shelter, and was utterly without incident. But it did give me a chance to finish one of my christmas present books – ‘Serious’ by John McEnroe. A good read, for sure, clearly aimed at tennis fans (a fair few play by play dissections of big games, big sets big matches). He didn’t turn out to be quite the sage I’d assumed he was from his commentary skills – he’s one of the best sports commentators I’ve ever encountered (and, to be fair, that’s not many, given my general antipathy to all sport except tennis), but his wisdom in commentating on the psyche of the players doesn’t really seem to have come from having lived a sage life. Maybe he’s just learned from having got it all wrong in his own life. Definitely a worthwhile read though. So not much sleep last night, which meant two things – a) I missed church by not waking up til 1pm after getting to bed at 6.45, and b) I missed most of the Soil Association organic market thingie happening down by the Barbican. It was organised by the lovely Ruthie, and featured some lovely live music from the lovely Andy Buzzard and Jonny Gee. Great to see them play, if only for one number. Also gave me a chance to meet lots of cuddly musos and invite them along to Thursday’s Recycle Collective gig, which I’m getting more and more excited about the closer it gets – the potential musical marvellousness in a trio of me, Cleveland and BJ is pretty huge, methinks. We’ve played together before, when I did a gig at Darbucka last year that both of them guested on, and it was magical. Don’t miss it! So, after getting back from the organic thingie, I’ve just finished, submitted and paid my tax return/bill for 2004-2005. Fortunately, I only had about £50 to pay over and above what I’d already paid on account for last year… well, fortunately for now, unfortunate if you think that it means I earned less than the previous year (main reason for that is that in 2004 I was still receiving HUGE PRS cheques for the Level 42 tour…) Good news is, online CD sales were higher in 04-05 than ever before, which is great news. One of my resolutions for next year is not to leave it til Jan 2006 to submit my tax return. I’d LOVE to actually get it done in April for the first time ever, and then have all year to pay a figure that I actually know. In order to do that, I’ll have to get my financial records for this year up to date in the next week, so I can stay on top of it from here on in… here’s hoping. As an aside, I submitted my tax return online – what a breeze! It does all the calculating for you, tells you the boxes you’ve missed, makes sure your sums all add up, and gives you a print out at the end. Couldn’t be easier. And now I’ve done the taxation bit, I feel inspired to write some letters to my MP to do something about the representation bit. I’m a fan of tax, in principle, I’m happy to pay my way, and to pay more to help those who haven’t got enough. But I do wish we had more say over how it was spent, and a less wasteful exchequer – Government spending is a disaster, which while not doing away with the need for taxation, certainly makes most people’s loathing of it a lot easier to understand. 10) – less time wasted online, more time practicing.